How did small bands of nomadic Mongol horsemen unite to conquer much of the world within a span of decades? A whole book could be written on that, and it probably will be, if a new "Indiana Jones" movie gets made using Genghis Khan. The reasons are numerous and involve many different things but climate change is a less-considered one. Yet researchers studying the rings of ancient trees in mountainous central Mongolia say his conquest was likely due to nice weather. The rings show that exactly when the empire rose, the normally cold, arid steppes of central Asia saw their mildest, wettest weather in more than 1,000 years - maybe we can call it a Mongal Warming Period (MWP). Grass production likely boomed which meant the ability to feed greater numbers of war horses and other livestock. The tree rings spanning from 900 to 2011 also exhibit an ominous modern trend: Since the mid-20th century, the region has warmed rapidly, and the rings show that recent drought years were the most extreme in the record—possibly a side effect of global warming. In a region already pressed for water, the droughts have already helped spark a new migration in a vast region where people until now have lived the same way for centuries, moving herds from place to place and living in tents. "Before fossil fuels, grass and ingenuity were the fuels for the Mongols and the cultures around them," said lead author Neil Pederson, a tree-ring scientist at Columbia University's Lamont-Doherty Earth Observatory. "Energy flows from the bottom of an ecosystem, up the ladder to human society. Even today, many people in Mongolia live just like their ancestors did. But in the future, they may face serious conditions." In the late 1100s, the Mongol tribes were racked by disarray and internal warfare, but this ended with the sudden ascendance of Genghis (also known as Chinggis) Khan in the early 1200s. In just a matter of years, he united the tribes into an efficient horse-borne military state that rapidly invaded its neighbors and expanded outward in all directions. Genghis Khan died in 1227, but his sons and grandsons continued conquering and soon ruled most of what became modern Korea, China, Russia, eastern Europe, southeast Asia, Persia, India and the Mideast. The empire eventually fragmented, but the Mongols' vast geographic reach and their ideas—an international postal system, organized agriculture research and meritocracy-based civil service among other things--shaped national borders, languages, cultures and human gene pools in ways that resound today. Genghis Khan's last ruling descendants ran parts of central Asia into the 1920s. Some researchers have postulated that the Mongols expanded because they were fleeing harsh weather at home--but Pederson and colleagues found the opposite. 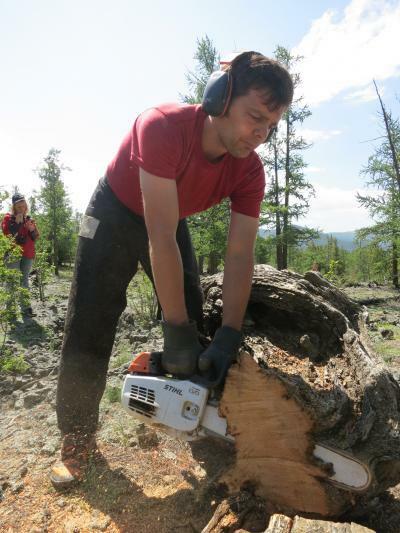 In 2010, Pederson and coauthor Amy Hessl, a tree-ring scientist at West Virginia University, were studying wildfires in Mongolia when they came across a stand of gnarled, stunted Siberian pines growing out of cracks in an old solid-rock lava flow in the Khangai Mountains. They knew that on such dry, nearly soil-less surfaces, trees grow very slowly, are exquisitely sensitive to yearly weather shifts, and may live to fantastic ages. In a series of expeditions, Pederson, Hessl and colleagues sampled the pines' rings, sawing cross-sections from dead specimens, and removing harmless straw-like cores from living ones. They found that some trees had lived for more than 1,100 years, and likely could survive another millennium; even dead trunks stayed largely intact for another 1,000 years before rotting. One piece of wood they found had rings going back to about 650 B.C. These yearly rings change with temperature and rainfall, so they could read past weather by calibrating ring widths of living trees with instrumental data from 1959-2009, then comparing these with the innards of much older trees. The trees had a clear and startling story to tell. The turbulent years preceding Genghis Khan's rule were stoked by intense drought from 1180 to 1190. Then, from 1211 to 1225—exactly coinciding with the empire's meteoric rise--Mongolia saw sustained rainfall and mild warmth never seen before or since. The tree rings show that after the empire's initial expansion, Mongolia's weather turned back to its more normal dryness and cold, though with many ups and downs over the hundreds of years since. The 20th and early 21st centuries are the exception. In the last 40 years, temperatures in parts of the country have gone up by as much 4.5 degrees F—well over the global mean rise of 1 degree. And, since the 1990s, the country has suffered a series of devastating summer droughts, often followed by a dzud—an unusually long, cold winter. The tree rings show that the most recent drought, from 2002-2009, compares in length and paucity of rainfall only to those of the pre-empire 1120s and 1180s. Perhaps more important: the drought of the 2000s was the hottest in the entire record. The heat evaporated water stored in soil, lakes and vegetation, and, in combination with repeated dzuds, devastated livestock. The last dzud alone, in 2009-10, killed at least 8 million animals and destroyed the livelihoods of countless herders. Now, displaced Mongol herders have formed a new invasion force—this time all headed to the capital city of Ulaanbaatar, which has swollen to hold nearly half the country's population of 3 million. Climate models predict that as the world warms, heat in inner Asia will continue to rise substantially faster than the global mean. Pederson says this means that droughts and other extreme weather will probably worsen and become more frequent. This could further reduce livestock and hurt the few crops the region grows (only 1 percent of Mongolia is arable land). New mining ventures and other industrial activities may employ some of the many people fleeing the countryside—but these also consume water, and it is not clear where that will come from. "This last big drought is an example of what may happen in the future, not just in Mongolia but in a lot of inner Asia," said Pederson. "The heat is a double whammy—even if rainfall doesn't change, the landscape is going to get drier." Previous studies by others have advanced the idea that climate swings can change history. These include events such as the disappearance of the Maya, the expansion and fall of Roman imperial power, and, in a separate Lamont-led study, the 13th-century collapse of southeast Asia's Angkor civilization. Most focus on droughts, floods or other disasters that arguably have cut off empires; the new study is one of the few to explore the more complex question how climate might have invigorated one. The researchers "make a compelling argument that climate played a role in facilitating the Mongol migration," said David Stahle, a paleoclimatologist at the University of Arkansas who has studied the mysterious disappearance of the English Roanoke colony off North Carolina, coinciding with what tree rings show was a disastrous drought. "But," said Stahle, "we live in a sea of coincidence—something like that is hard to prove. There could be a lot of other factors. They've provided an incredibly important climate record, and put the idea out there, so it will stimulate a lot of historical and archeological research." The tree-ring study is the first in a related series by a larger interdisciplinary team working with Pederson and Hessl. Hanqin Tian, an ecologist at Auburn University in Alabama who studies modern grasslands, is working on models to correlate ancient grass production with the tree-ring records of weather. In coming months, team member Avery Cook Shinneman, a biologist at the University of Washington, plans to analyze sediments taken from the bottoms of Mongolian lakes. These can be read somewhat like tree rings to estimate the abundance of livestock over time, via layers of fungal spores that live in the dung of animals; this would confirm whether animal populations did indeed boom. The conquering Mongols left very few written records of their own, but Nicola Di Cosmo, a historian at the Institute for Advanced Study in New Jersey and coauthor of the current paper, will study accounts of the time left in China, Persia and Europe that might provide further clues. Upcoming in the Proceedings of the National Academy of Sciences.